"I've done my thing the whole year. Mark has been phenomenal. But it's been my job to lose and I've been consistent enough to keep it. That's one of the things I've done a good job with this year, not thinking about little things like (competition). If I did the same things this year (as last year), then shame on me for not learning my lesson." Regardless of whatever crowd Milwaukee goalie Drew MacIntyre had to fight through to get regular-season minutes, he's always had a knack of separating himself come playoff time. Through his first 13 career first-round playoff games, MacIntyre is 10-3 with a 1.53 goals-against average and a .947 save percentage. He gave up just four goals in his team's four-game sweep of Rockford to open this postseason, stopping 105 of 109 shots in the process. "The bottom line is I've learned I can't worry about the other goalies on my team," said MacIntyre, 25. "I've sat on the bench for some playoff runs. I've learned that chance (to be a playoff goalie) doesn't come along every year. I know how much playoffs can make a goalie." It's a reality that MacIntyre understands most acutely after missing out on that chance last season. MacIntyre was the No. 1 goalie for Manitoba for most of last season before rookie Cory Schneider heated up at the end. MacIntyre admitted he pressed too hard to keep up and turned in a couple of clunkers. Schneider won the job for the playoffs. MacIntyre joined Milwaukee as a free agent this season, but slammed into almost exactly the same challenge. Rookie goalie Mark Dekanich set a franchise record with a 2.09 GAA in 30 games, but this time MacIntyre put together a great start-to-finish effort (34-15-4, 2.30, .921) to hold his spot into the playoffs. "I've done my thing the whole year. Mark has been phenomenal. But it's been my job to lose and I've been consistent enough to keep it," said MacIntyre, who led the AHL in wins. "That's one of the things I've done a good job with this year, not thinking about little things like (competition). If I did the same things this year (as last year), then shame on me for not learning my lesson." For a goalie in just his fifth full pro season, MacIntyre has had a ton of quality partners in net. With Grand Rapids, he shared time with Joey MacDonald and Jimmy Howard. With the Moose, he worked with Wade Flaherty and Schneider. Dekanich looks like a keeper for the Admirals. "I've definitely played with some pretty talented goalies. You have to pick out something from each situation to learn from," MacIntyre said. "I've never been given a job. I've had to work for each one of them. I literally wouldn't want it any other way." Then he should be happy for the foreseeable future. MacIntyre will be a free agent again this summer, and he doesn't expect his next landing spot to be any softer in terms of guaranteed playing time. "All year I haven't thought one day ahead. I'm not going to start now," he said. "This is the second-best league in the world. The other one (the NHL) is the best league in the world, and that's where I want to be. There's always going to be challengers. I've learned to worry about your own game." Byers scored in the opener of a first-round series against Worcester on April 16, then had the first assist on the game-winner in Game 2 on April 18. Those were the first two games he'd played since Oct. 31, when he suffered a torn ACL in his right knee by colliding with a teammate in a game against the Sharks. At first, it wasn't a certainty that Byers would be able to return at all this season. He rehabbed for nearly six months before getting medical clearance to play again. He and Hartford coach Ken Gernander decided he would be a go for the start of the playoffs just days before they began. "This year has been quite the grind for me personally. It's been a long 5 1/2 months," Byers said. "When I first stepped on the ice (in practice), I knew I had a lot to improve on. It was a long journey. A lot of sweat, close to tears sometimes." Byers' instant-impact return was no surprise to him. Once he had the green light to play again, he said he was looking for more than a few token appearances. "It's weird. Once you get back into it, a period and a half into it, you get your groove back," he said. "The minutes I wanted to play were going to be quality minutes. I didn't want to come back just to say I came back. That's when things don't turn out the way you want them to, when you do things for the wrong reasons." Duncan goes back to school -- If he was going to be sitting around this time of year, forward Ryan Duncan preferred to do so in a library or classroom rather than a rink. Duncan made the tough choice to walk away from his tryout contract with Bridgeport after Game 3 of his team's first-round series against Wilkes-Barre/Scranton and return to the University of North Dakota, where he had built up an impressive supply of glory days the past four seasons. Duncan joined the Sound Tigers at the end of the regular season, skating in two games. He did not dress for any of the playoff games, so he decided that going back to school and finishing work toward his degree in business management was the prudent choice. Whether this is just a break in his pro hockey career or the end of it instead is a question to be resolved later. Duncan won the Hobey Baker as a sophomore and in four seasons he contributed 172 points in 175 games. But he stands just 5-foot-6 and hasn't had the pros clamoring for his services. And since he joined the Sound Tigers so late, the team didn't have the luxury of working him in enough to be confident using him in the playoffs. "I was a little disappointed I didn't get more of an opportunity," Duncan said. "That's just the way it went. We'll see what happens. Hopefully I'll get another chance, and will be given more of an opportunity. I think I can play at that (AHL) level." Around the AHL -- Grand Rapids' Darren Haydar picked up three assists vs. Hamilton on April 20, becoming the AHL's all-time leader in playoff assists with 74. Haydar is also the playoff king in goals (56) and points (130). ... Manitoba's Jason Krog has moved into ninth place among career AHL playoff scorers (29-58-87 in 67 games played). ... A crowd of 9,111 attended the opener of the Manitoba-Toronto series at the MTS Centre in Winnipeg, the largest crowd for a first-round Calder Cup playoff contest since April 29, 2005, when 10,904 fans watched the Moose eliminate St. John’s in Game 5 of their division semifinal series. 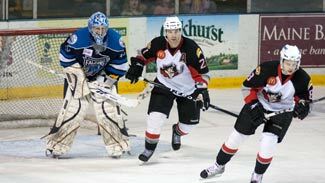 ... Bridgeport's 5-4 OT win against Wilkes-Barre/Scranton in Game 3 of their series April 19 marked the teams’ 10th overtime tilt in 17 all-time playoff games and the 15th one-goal game. The road team has won 12 of the last 14 postseason contests between these teams, including all three so far this year. ... Wilkes-Barre/Scranton’s Chris Minard scored his third career playoff sudden-death game-winner vs. the Sound Tigers in Game 2 on April 18, tying Don Biggs, Alexandre Giroux, Todd Hlushko, Chris Joseph and Mike McHugh for the all-time record. ... Hershey's penalty kill ranked last in the league in the regular season at 78.6 percent. Through their first two games of their playoff series against the Phantoms, the Bears' PK was 12-for-12.